Given that Forrester have had some good results this season, this was a potential banana skin for Berwick – but eight tries, all converted, saw the home side claim maximum points whilst Border neighbours Hawick Quins defeated Royal High. This combination of results saw Berwick climb past Royal High to move top of BT East League 1. Berwick scored the first try in the eighth minute of this match, writes Colin Frame, through Jack Dalrymple, who had come into the team for Andrew Skeen. Skeen was away at Melrose being inducted into their Hall of Fame for 7’s – a tremendous honour for the Berwick player. Dalrymple certainly stepped up with a hard-running display making the gain line with every carry and some clever running into the bargain. His first try came after a good lineout take and carry from the forwards allowed inside centre Duncan Hardie enough space to bamboozle the defence with a lovely side step. Then an accurate pass found Dalrymple in support and from there it was a clinical finish. Jack Webster stepped up to convert to make it 7-0. Forrester were giving the Berwick scrum real problems and eventually the referee awarded them a penalty for Berwick standing up in the scrum. They duly slotted it to close the gap to 7-3. However, within a few minutes Berwick scored again.Hardie didn’t need any help in touching down after a nifty side step took him clear to score. Webster continued to kick immaculately to make it 14-3. 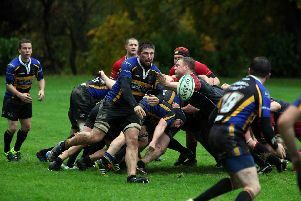 After a nightmare from Forrester’s number eigjht, who left the ball behind from a scrum, quick thinking scrum half Cameron Rogerson was on it faster than anyone collecting the ball and dashing over to score near the posts. Webster duly converted and Berwick were 21-3 up at half time. The second half started like the first with a Dalrymple try and a Webster conversion. This was a much more straightforward affair -a solid scrum and a quick pass to Dalrymple allowed him the half chance he needed to score despite the defender’s attention. Winger Jamie Pick scored the next try finishing off several phases of play with a touch down very near the touchline. Webster’s golden day off the tee continued as he slotted over a very difficult kick from the touchline. It was the forwards turn to get on the scoresheet next and it came from flanker Ali Grieve who made a powerful drive showing great strength to get the ball down. Again, Webster slotted the conversion from a difficult angle to make it 42-3. Berwick’s seventh try came from hard working captain Tom Jackson who galloped home from the 22. This was probably the easiest conversion for Webster who made it 49-3. With five minutes to go Berwick got their last try through evergreen winger Gareth Hill who gathered a flip pass out wide to score from five metres. It was fitting that man of the match Jack Webster should finish the scoring to complete a perfect conversion rate with his most difficult kick from near the far side touch line. Next week’s game will see first play second as Royal High come to Scremerston to see if they can regain the top spot. If Berwick can keep playing at this level then they should be more than able to see off the visitors, but any drop from these high standards will see their stay at the top of the league being short-lived.